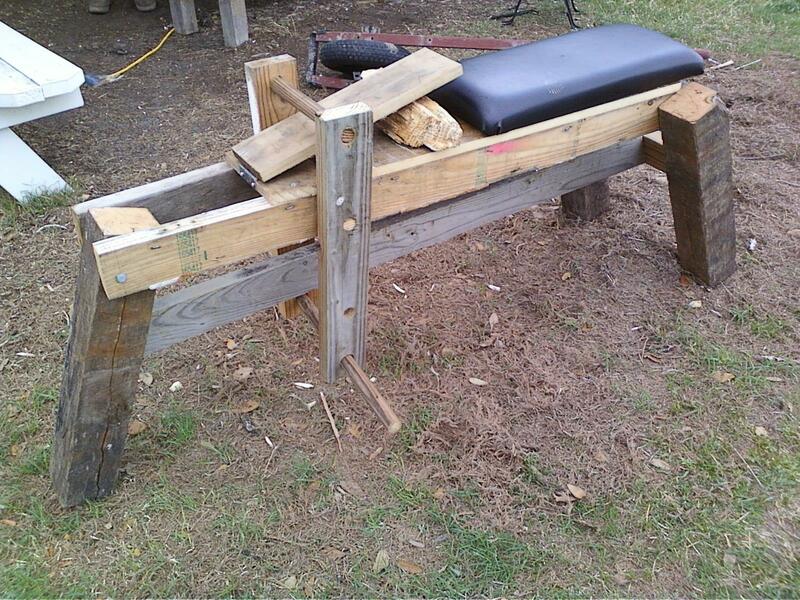 In preparation for a walkin’ cane project, I built a dirty looking 2×4 shaving horse. It ain’t named Trigger, though I might name it Jimmy Stewart. Whenever I think of the description “long face”, I think of Jimmy Stewart. I’ve seen four-legged and three-legged versions of a shaving horse, and I chose to go with three-legged. Three legs means stability during a agonizingly short build time. 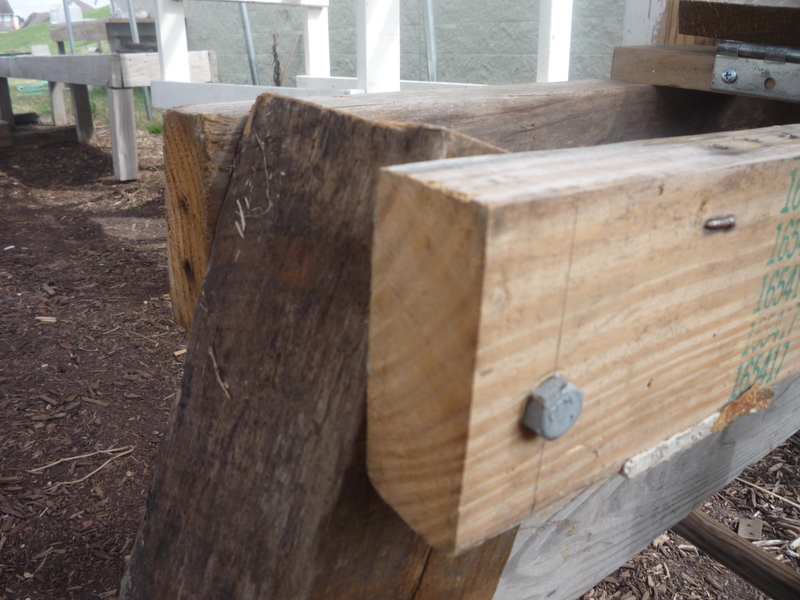 I hand-sawed some oak 4x4s to 21 or so inches, then used lag bolts to attach them to two 2x4s. The length of the base is 52″. I drilled offset pilot holes for the lag bolts on the 4×4 posts – one pilot hole was 1 3/4″ down from the top, the next was drilled at 2″ on the opposite side. I drilled mated pilot holes through the 2x4s. When I attached the leg, I screwed one 2×4 to a post, then swung the leg so the offset holes matched. 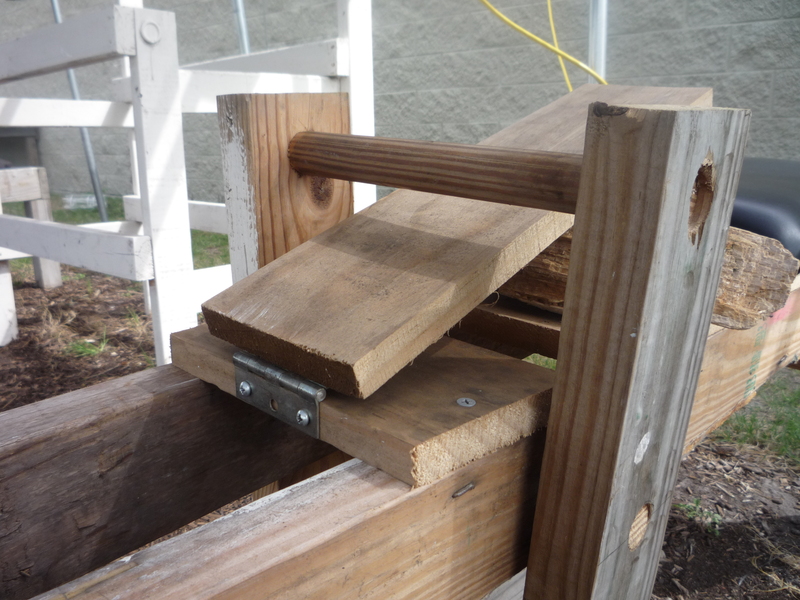 The result was a leg both securely attached and splayed out at an angle for stability. I wish I could have created a mortise and tenon joint, with a dowel & pin to ease knock-down, for this step. I built a stretcher for even more stability. I’m going to be using this contraption for a few weeks, I don’t want it to break after a few hours of use. I attached the back of the stretchers with “pocket screws” or “toe-in” nail technique. Except this uses 4″ deck screws. 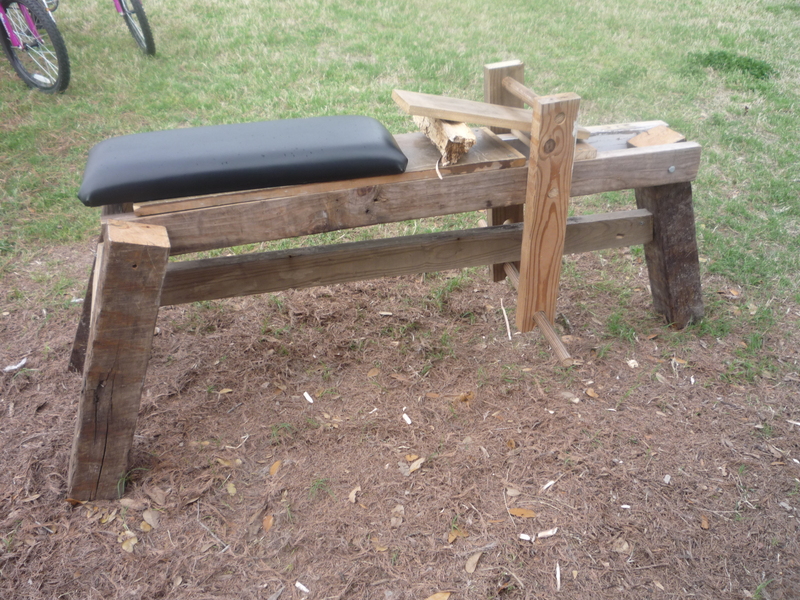 Next, I attached a seat to the back. I used a 1×12, door hinge and a a1x6 to form the base that the work will be held against. A piece of firewood became the wedge. You should put these things on before you attach the swingarm & yoke. It makes the process easy. Don’t be difficult like me. Now comes a major design decision. 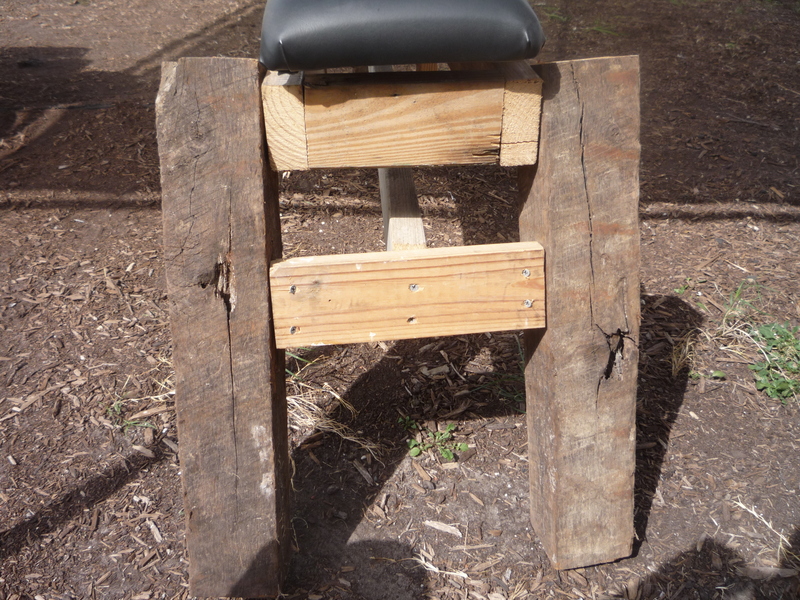 After researching about shaving horses, I discovered my design would be an “English” sawhorse (ok, maybe name it Ian McKellen?) rather than a “German” design. 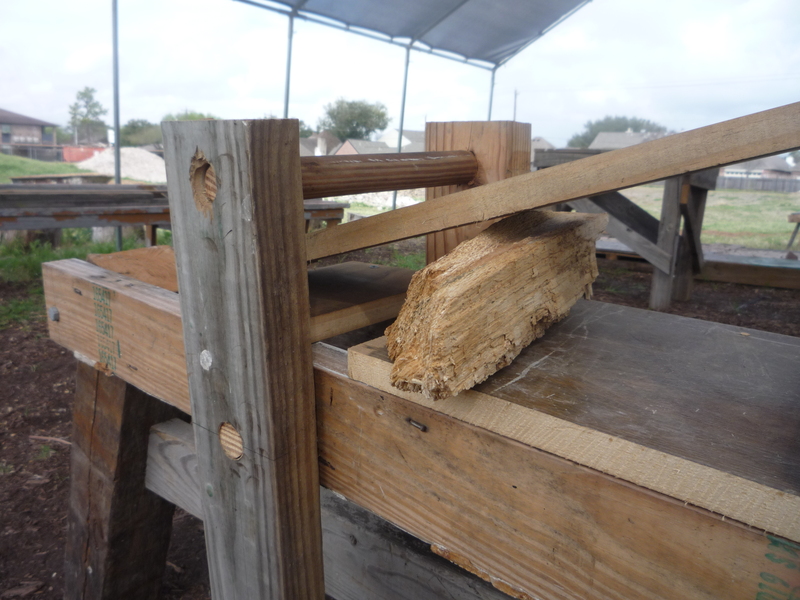 English sawhorses have two swing-arms which push a “yoke” down onto the workpiece. The German style uses a swingarm with a dumbbell on the top, or some such thing. Check out Tom Rettie’s piece in Blood & Sawdust or Peter Follensbee at Greenwoodworking for more info. I stuck with the English style. The swing-arms are 24″ long. I drilled holes at 1″, 16″-ish and 22″ on center from one end. The yoke, axle and leg pegs I cut from a cast off broomstick, just wide enough to give clearance to swing. I drilled the holes for the yoke and axle smaller than the broomstick’s diameter. Once the ends of the broomstick were shaved down, friction has kept the yoke and axle together. And that’s it – if you work quickly and don’t have too many distractions, this plan takes around 3 – 5 hours. Most of that I spent cutting those 4x4s by hand.